The Carmelite Institute of Britain and Ireland (CIBI) is a collaborative initiative of the British and Irish Provinces of Carmelites and the Anglo-Irish Province of Discalced Carmelites. Through the provision of online courses, it is a way of celebrating and sharing the rich heritage of the Carmelite tradition – both of the Carmelites of the Ancient Observance (O.Carm.) and Discalced Carmelites (O.C.D.). Our distance-learning courses ensure this rich heritage can be shared world-wide and being university-accredited, we do so to the highest standard. Our courses aim to enhance the student’s spiritual education through a deeper understanding of Spirituality, History and Theology as it is lived in the over 800-year old Carmelite tradition. We welcome students of all denominations and backgrounds, who search to deepen their understanding. Accordingly, our courses cater for many levels of interest and academic pursuit: We offer courses to those looking for an introduction to Spirituality, with a Carmelite focus; those wishing to strengthen their spirituality through a deeper understanding of Carmelite history and tradition; and for those who seek Carmelite study in a more formal way, there are accredited courses at certificate, diploma, degree and masters level. So whether you seek a Certificate in Spirituality course or a Masters in Theology, there is something here for everybody! CIBI was founded in November 2005. In September 2006, the first students commenced their studies on two courses, a Diploma in Carmelite Studies and an Adult Education Diploma in Carmelite Studies, both accredited by the Milltown Institute, Dublin. The first graduates of the Adult Education Diploma in Carmelite Studies were conferred in October 2009 and the first graduates of the Diploma in Carmelite Studies were conferred in October 2011. 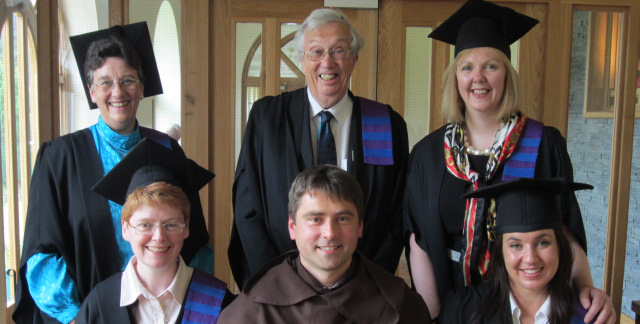 In 2011, York St John University accredited CIBI’s MA in Carmelite Studies. The first graduates of this award were conferred in October 2016. With the closure of the Milltown Institute in 2015, CIBI requested accreditation for a Bachelor of Theology (B.Th. Carmelite Studies) and a Master of Theology (MTh Carmelite Studies) from St Patrick’s College, Maynooth, Co Kildare, Ireland. The first students commenced their studies in September 2015. In 2016, two exit courses from the B.Th. (Carmelites Studies) were approved by St Patrick’s College, Maynooth, namely the Certificate in Spirituality (Carmelite Studies) and the Diploma in Spirituality (Carmelite Studies). Both courses commenced in September 2016. In 2019 CIBI introduced two new courses on Formation – The Initial Formation Programme and The Ongoing Formation Programme. In addition to the above courses, CIBI also offers a non-accredited elementary course, the Discovering Carmel Certificate, which is awarded to students who have completed eight modules from a choice of more than forty modules on various aspects of Carmelite History, Spirituality and Saints. The option of studying full or part-time, along with the online distance-learning delivery, has made CIBI courses in Carmelite studies popular throughout the world. Presently, students are drawn from over 20 countries. Many come from English speaking countries including Australia, Canada, Ireland, New Zealand, U.K., USA and Zimbabwe. Students have a wide age range between the 20’s and the 80’s. The spiritual focus of the Carmelite Order is contemplation. Carmelites understand contemplation in a broad sense encompassing prayer, community, and service. These three elements are at the heart of the Carmelite charism (spiritual focus). The mission of the Carmelite Institute of Britain and Ireland (CIBI) is to provide a pathway for student’s to explore contemplation in a modern day context, set to the back drop of a bountiful 800-year old Carmelite tradition; to provide and uphold a recognised and esteemed academic pathway in which to do so; for the purpose of enriching the lives of our students and also of providing a platform for this rich heritage to secure its pathway into the future. Ease of Access: Flexible delivery allows students to study full-time or part-time; delivered by distance-learning, it allows students the flexibility to study in the time and place that suits. Student-centric approach: Relevant and reflective of student’s needs, through the provision of a wide breath of modules tailored to multi-level courses at certificate, diploma, bachelor and master’s level. The great diversity of humankind: While rooted in a Roman Catholic theological ethos, CIBI welcomes students from all and no religious traditions. Acknowledging the individual and their spiritual growth: Our student’s receive individual feedback on each piece of work submitted and there is always a member of our team to advise and assist. The Institutes trustees are the presiding Provincial of each of the three Carmelite Provinces. Who appoint the members of the Executive Board. Academic Boards are drawn from renowned academics with an internationally recognised Extern Examiner who is approved by the accrediting body. The academic standards of all courses are overseen by the Director of studies. Students receive a prompt response to their emails for advice, support and encouragement from the institutes administrative team. CIBI has a varied and international staff of Author and Correctors. 25th May St Mary Magdalen de Pazzi, O.Carm. Virgin S03: St Mary Magdalen de’Pazzi, O.Carm. 7th June Bl. Anne of St Bartholomew, O.C.D. Virgin. 12th July Sts Louis and Zélie Martin. S08: Sts. Louis and Zélie Martin. 20th July St Elijah, Prophet and our Father H03: Figures of Inspiration: Mary and Elijah. DC03: Elijah in the CarmeliteTradition. 24th July Bl John Soreth, O.Carm. Priest DC17: Bl. John Soreth. 27th July Bl Titus Brandsma, O.Carm. Priest & Martyr S05: Bl. Titus Brandsma O.Carm. DC25: Bl. Titus Brandsma, O.Carm. 9th August St Teresa Benedicta of the Cross O.C.D. (Edith Stein), Martyr MTh05 :Reading Edith Stein. S07: St Edith Stein, O.C.D. 12th August Bl Isidor Bakanja, Martyr DC37: Spirituality and Social Justice: Isidore Bokanja. 17th September St Albert of Jerusalem, Bishop and Lawgiver of Carmel S09: St Albert of Jerusalem. 1st October St Thérèse of the Child Jesus, O.C.D. Virgin & Doctor of the Church S04: St Therese Lisieux. S10: St Therese as Revealed in her letters. 15th October St Teresa of Jesus O.C.D. (Teresa of Avila), Virgin & Doctor of the Church S01: Teresa of Avila. 8th November St Elizabeth of the Trinity, O.C.D. Virgin S06: St Elizabeth of the Trinity. DC24: Elizabeth of the Trinity. 19th November St Raphael Kalinowski, Priest DC19: St Raphael Kalinowski. 14th December St John of the Cross, O.C.D. Priest & Doctor of the Church S02: St John of the cross, Carmelite, mystic and poet. S13: The Impact of God: Soundings from St John of the Cross. MTH03: St. John of the Cross. DC36: St John the Cross. 16th December Bl. Mary of the Angels, O.C.D.